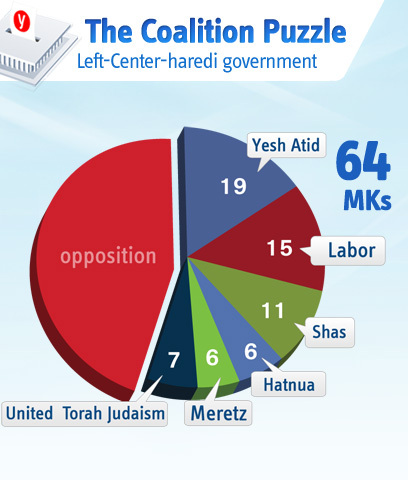 The results of Israeli elections 2013 spell one of the narrowest gaps ever noted between the Right and Center-Left blocs in the Knesset – both blocs are about tie and one aspect is that Three Arab parties got 12 members to new Knesset. Now PM Netanyahu has a complex political reality and now stands before a difficult task: creating a stable coalition. The first scenario for PM Netanyahu is the formation of a narrow right-wing government including his natural partners: Habayit Hayehudi led by Naftali Bennett and the ultra-Orthodox Shas and UTJ. Besides this alternative is narrow and thus fragile also PM Netanyahu’s wife – Sara – for personal reasons will push to exclude Bennett from the coalition. A second scenario is the creation of a Right-Center government (Yair Lapid’s Yesh Atid, Tzipi Livni’s Hatnua and Shaul Mofaz’s Kadima) excluding the ultra-Orthodox parties. Still, sources close to Netanyahu say that he fears forming a coalition without the ultra-Orthodox, considered in his eyes and despite everything, natural partners and political allies. The best scenario for Netanyahu is forming an broad government with his natural right-wing partners and the Center-Left bloc. In this case, size could also be a disadvantage and Netanyahu will struggle to set common guidelines for all coalition members. One scenario is to form government without Netanyahu and his Likud-Beiteinu. This Left-Center-haredi government could be led by Yair Lapid who anyway is the big winner of elections. Personally I expected a bit better result for Labor due the voter turnout. The predicted victory for Bennet stayed slim but the excellent result of reporter Yair Lapid (Yesh Atid) was a surprice at least for me. In overall the outcome is interesting while it gives many alternatives to PM Netanyahu to form his next government. Israeli PM Netanyahu decided elections to be held in 22nd January 2013, in advance of the November 2013 deadline. The immediate cause for early elections might be his troubles to agree budget cuts with his coalition colleagues. The key issue in Israeli politics during last decades has been the Israeli-Palestinian peace process but this time differ; socioeconomic questions rises to top of agenda. While the Israeli economy is slowing the ruling coalition has proposed budget cuts and already some social protests occurred summer of 2011. Other issues are the Iranian thread and PM Netanyahu’s leadership skills to copy with it, tensions between secular and religious Jews in Israel especially related to military service and a debate about how to break the deadlock in the Palestinian issue which has close link to worsened relationship between U.S and Israel. 34 parties are competing in the upcoming Israeli national election that will be held on Tuesday, January 22, 2013. The Knesset, the Israeli parliament, is elected directly by the voters, not through a body of electors. Elections to the Knesset are based on a vote for a party rather than for individuals, and the entire country constitutes a single electoral constituency. 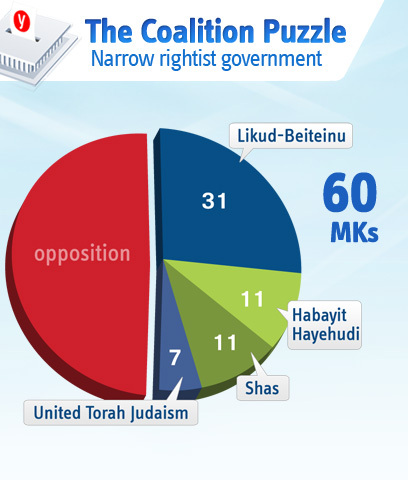 The 120 Knesset seats are assigned in proportion to each party’s percentage of the total national vote. However, the minimum required for a party to win a Knesset seat is 2% of the total votes cast. Who will be the parties and leaders running in the next election? 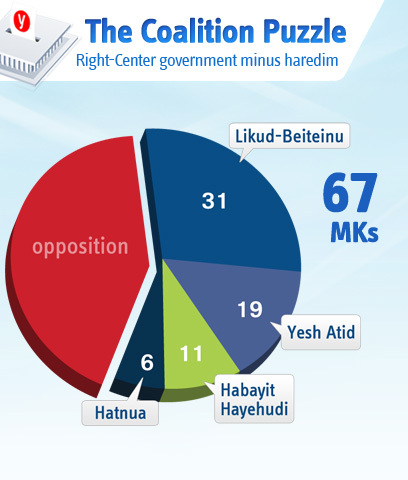 The 120 seat Knesset is elected on a directly proportional party list system. Each party submits a list of candidates for the Knesset and the entire country votes as a single constituency, with each voter choosing a party list. No single party is likely to win much more than 30 seats, so after the election the President will ask the party leader most likely to be able to form a majority coalition to attempt to form a government. Likud: Led by Benjamin Netanyahu, Israel’s main centre-right party is looking to maintain its role as the dominant party in the government, and will be expecting to emerge as the largest party by a good margin. Likud currently enjoys consistent rates of support and polls indicate that Netanyahu is seen as the most appropriate politician to be Prime Minister, and is the most trusted on security and defence issues. Kadima: Currently the largest faction, the centrist Kadima party has recently elected Shaul Mofaz as its leader, replacing Tzipi Livni who consequently resigned from the Knesset. Mofaz took over a party which has been struggling in the polls since the summer of 2011. The shift in focus to socioeconomic issues left Kadima, which was focused largely on promoting the peace process, somewhat irrelevant. Although Mofaz is a respected former IDF chief of staff, defence minister and a determined politician, he has not established himself as an alternative to Netanyahu as Prime Minister. His short lived coalition with Netanyahu earlier this year further damaged his and Kadima’s standing. Yisrael Beiteinu: This right-wing party, led by hawkish foreign minister Avigdor Lieberman, was the third-largest in the current Knesset and played a prominent role in the government. Recently, the party has adopted a more vocal position on the exemption of Arabs and ultra-Orthodox from military service. Labour: After years of falling support, Labour will be looking to capitalise on the renewed interest in socioeconomic issues following the socioeconomic protests of 2011. Under the new leadership of Shelly Yachimovich, a former journalist with a strong record on social issues, Labour has sought to reclaim its social-democratic brand and has succeeded in re-energising its activist base, on which it will rely upon in the upcoming election. Shas: Although the ultra-Orthodox Sephardic party has been led by Eli Yishai for over a decade, Shas has been unable to recreate the popular fervour it possessed under its previous political leader Aryeh Deri in the 1990s. Shas will try to energise its supporters against public anger at ultra-Orthodox exemption from military service, and in defence of welfare benefits that favour its constituents. Meretz: Following widespread disillusionment with the peace process after the eruption of the second Palestinian intifada, the left wing, secular Meretz became an almost inconsequential political faction. Under the new leadership of Zehava Galon, the party could enhance its power to a small degree with the support of upper-middle class liberal and Kibbutz voters. Atzmaut: After splitting from Labour, five MKs under the leadership of Defence Minister Ehud Barak formed this new centrist faction, which is now essentially a vehicle to return Ehud Barak to the Knesset so he can remain as Defence Minister. However, in some polls, the party does not succeed in crossing the electoral threshold (2% of the votes). Yesh Atid (‘There is a Future’): The entry of former journalist Yair Lapid into politics may be one of the biggest changes in the next Knesset. Lapid has positioned himself as a centrist outsider and will run on a consensual messages of social responsibility and equality of the social burden. Recent polls predict the new party may receive up to 10-12 seats, but it is unclear whether the party will be able to sustain its momentum once the campaign heats up. United Torah Judaism: An ultra-Orthodox Ashkenazi party. National Union: A right-wing national religious party with strong support from voters in West Bank settlements. Mafdal: Another right-wing national religious party with strong support from voters in West Bank settlements. Ra’am-Ta’al: A national-Islamic Arab party promoting an end to Israel presence in the West Bank and recognition of Arab-Israelis as national minority. Ahmad Tibi is the faction’s most prominent MK. Hadash: A Jewish-Arab socialist party supporting Israeli-Arab peace and promoting a left-wing socioeconomic agenda. Balad: An Arab nationalist party led by MK Jamal Zahalka. 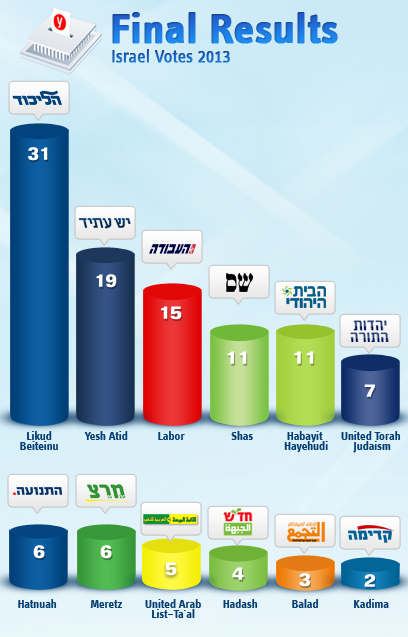 More about parties in interactive Parties Guide by Haaretz and about key election candidates in chart by BICOM. With Israel set to vote on Tuesday, party leaders yesterday positioned themselves on policy issues and the composition of the next government. A series of surveys was published in Israel, giving a final indicator of how the country might vote in next week’s election. Each of the polls indicates that the Likud-Beitenu list headed by current-prime minister Benjamin Netanyahu will be the largest faction in the next Knesset, the Labour Party is likely to be the second largest party followed by Jewish Home. Looking at the political map as a whole, the right-wing and religious bloc of parties will win the centrist and left-wing parties with margin of 12 – 26 seats – a range that all but guarantees Netanyahu a third term in office. The former prime minister Ehud Olmert, who has recently been cleared of corruption charges and relieved of community service, could have been an alternative of hope to the Netanyahu regime; however he did not join to the race even Kadima MKs, businessmen, public opinion leaders and regular citizens were pressuring him to do so. After four years in which the center-left bloc was missing a dominant leader, Olmert could have changed the situation entirely. Amid the stalemate in the peace talks with the Palestinians, the shaky relations with western countries, the fear of a brutal war with Iran and the sense that there is no hope for a better future – Olmert could have been the real alternative. But sadly not now. 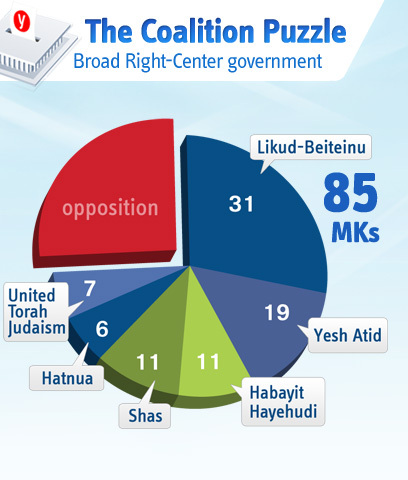 While right- wing block has united their lines Kadima, the largest party in the outgoing Knesset and the main opposition to Netanyahu’s government, will split among no less than eight different factions. None of these parties will have enough power to seriously challenge the next coalition as the centre and the mainstream Zionist left is more fragmented than ever. One more aspect has its effect to result. According to statistics 80 percent of Israeli citizens over the Green Line voted in the last election, while the average rate in Haifa, Tel Aviv and Beersheba is 57%. The numbers presented by Peace Now come from 2009, when 64.72% of eligible Israelis voted. One can guess that votes from disputed territories favour more the right than the left. As mentioned above the peace process has drifted on the background. The problem is that most Israelis consider the prospects for success in peace talks to be slim. The way they see it, Ehud Olmert in 2008 and Ehud Barak in 2000 offered the Palestinians a reasonable deal and they didn’t take it. Even when Israel got out of the Gaza Strip unilaterally the Palestinians weren’t satisfied, bringing Hamas to power and using the area to fire more rockets at Israel. However a good base for new peace talks is the fact that governments in Israel are relatively stable.The total number of governments that have fallen by no-confidence votes in all of Israeli history is one (in 1990). The most notable exception is former foreign minister Tzipi Livni, running at the head of ‘Hatnua’, (The Movement) a new party she has created. Of all the candidates competing in the Jewish, secular, Zionist centre-ground, she is the one most prepared to make the peace process a central part of her offer. She led Israel’s negotiating team with the Palestinians in 2008, and she is the one arguing that Israel should make every effort to resume final status talks in the belief that it’s possible to finish the job. The European Union was drawing up a detailed new plan to jump start peace talks. The plan is reportedly to be presented after the Jan. 22 elections. The plan includes clear timetables for the completion of the negotiations on all the core issues in the course of 2013 and it will include a clause demanding that Israel halt all settlement construction. As the British and French foreign ministries are sponsoring the initiative, also backed by Germany, it could ultimately be adopted by the EU as a whole. The EU plan’s ultimate objective was to bring about the establishment of a Palestinian state on the basis of the 1967 borders with east Jerusalem as its capital. however this EU initiative probably is as insignificant for peace process as always before. Israel Radio also reported that Jordan’s King Abdullah believes that peace negotiations between Israel and the Palestinians will resume next month. Israel Radio quoted him as saying that the start of U.S. President Barack Obama’s second term and the end of the Israeli election would serve as a window of opportunity for the sides to reconvene. Article first published as A Jordanian-Palestinian Confederation Is On The Move on Technorati. Israeli Prime Minister Benjamin Netanyahu and Jordan’s King Abdullah II had a secret meeting in Jordan during Xmas. After leak to media it was officially confirmed (PM press office) that the two leaders discussed Syria’s Chemicals – whether Syrian President Bashar Assad would use chemical weapons against rebels in the civil war and whether they could fall into the hands of radical elements. However the real agenda of the meeting is more interesting. Debkafile’s sources reveal that the issue was the aspects of a possible confederation between a Palestinian West Bank state and the Hashemite Kingdom. The meeting can be seen also in wider context as part of the new Sunni-Muslim-led pro-US axis. According Debkafile the Jordanian option has become a focal talking point in Amman, Washington and Palestinian centers. Netanyahu brought some pointed questions to the highly confidential one-on-one at the Hashemite palace: He asked the king how much responsibility would Jordan undertake in controlling West Bank security and intelligence activity? What were his plans for extending such control from the West Bank to the Gaza Strip? And how would Jordan’s intentions fit into the security arrangements demanded by Israel in both territories as part of any accord with the Palestinians? As Jordan has already recognized Israel and the two nations maintain full diplomatic relations the recognition process – a Palestinian state by Israel and Israel by the Palestinians as the national state of the Jewish people – would be skated round. While the UN General Assembly’s Nov. 29 upgraded the Palestinians to non-member observer status the Palestinian Authority is acting like representing an independent state and therefore eligible to join Jordan as a confederation partner. This kind of approach might be easier also for Hamas which would be saved from having to recognize the state of Israel. There are more straws in the wind attesting to the confederation project being on the move. According Debkafile’s sources in early December, the Palestinian Authority’s Chairman Mahmoud Abbas (Abu Mazen) secretly advised certain Palestinian leaders “to be prepared for a new confederation project with Jordan and other parties in the international community.” With these he probably was referring to Egypt, Jordan, Turkey and Qatar – these are the members of the pro-American Sunni Muslim-led axis which American diplomats established in Cairo last month in the course of Israel’s Pillar of Defense operation in Gaza and the negotiations that led to an Israel-Hamas ceasefire. On Xmas eve 2012 it was revealed that Turkey had assumed its role in this new bloc by dropping its two-year boycott of military cooperation with Israel within the framework of NATO. Ankara initially cut off ties of cooperation over the IDF raid of the Turkish Mavi Marmara ship which was on a mission to break Israel’s naval blockade of the Gaza Strip. In recent months, Mossad chief Tamir Pardo and the Turkish MIT intelligence director Fidan Hakan maintained back-channel interchanges and laid the groundwork for the two governments to start working together. In the same article I reported about statement made by Jordan’s Prince Hassan bin Talal of Jordan, who served as crown prince between 1965 and 1999. Recently October 2012 in a meeting with Palestinian citizens in Jordan, Prince Hassan bin Talal made an unusual statement, saying that the territories of the West Bank are actually part of the Hashemite Kingdom of Jordan. He added that the two state solution is irrelevant in the current stage. The Jordanian option has on occasion been raised as a promising approach. Given some of the facts from history this is not surprising, after all, most of Jordan’s population is Palestinian. In 1948, Arab armies attacked the newborn State of Israel. Transjordan annexed the area intended for an Arab state, and renamed itself the Kingdom of Jordan, calling the annexed area the “West Bank”. In 1967 West Bank came under Israeli control during the Six Day War of 1967. Jordanian option is implementing three-state solution – in its no-state meaning – if both West Bank and Gaza are annexed to Jordan. However more practical solution on the ground might be to annex Gaza to Egypt as this would be the three-state solution in its full meaning advocated e.g. I. Since 1967 Israel has maintained the separation between the West Bank and Gaza through different political and security means, such as leaving Jordanian laws in effect in the West Bank while leaving Egyptian laws in effect in Gaza, and substituting some of those laws with military statutes. I have been advocating long Three State Option as the most pragmatic solution to Israeli-Palestinian conflict. The geographic juxtaposition between Israel and Jordan should make delineating the border between the two countries in an agreement considerably easier than reaching a deal on a border between Israel and a Palestinian state that was planned to be established in the area. If three state solution will be implemented so Israel would receive security guarantees from Jordan’s monarchy, which made peace with Israel in 1994, rather than from a politically enfeebled Palestinian president as well from Egypt, which has peace deal with Israel since 1978, rather than from outside supervised Hamas. The Aim for the next stage of Israel-Palestinian negotiations after Israeli elections on January 2013 seems to be a long-term interim accord, while the core disputes on permanent borders, Jerusalem, the Palestinian refugees and the future of Israel’s settlements in Judea and Samaria would be leaved to a later round of negotiations at some unspecified time in the future. During election campaign Netanyahu and his party has been described as extreme right-wing nationalists who consistently refused to talk peace with the Palestinians. This is usual in Israel where hard rethoric transforms more moderate after elections. So if and when PM Netanyahu wins the poll it is possible that he also will return to the peace track after forming his next government, indeed it has also claimed that Israel and the Palestinians had agreed to resume peace negotiations in March 2013. Recently Israeli media published reports that PM Netanyahu planned to invite opposition leader and former foreign minister Tzipi Livni to join the next cabinet in her old job as lead negotiator in talks with the Palestinians. However it is estimated that Netanyahu has reserved that role for himself. Personally it is very refreshing that Jordanian option is moving on. For decades regional leaders, international community UN etc have sung the praises of two-state solution as the only option so my view has represented some kind of dissidence. While some prominent politicians now have came to the same conclusion I think that the reasons might be the same as mine: there is some sense with Three-state option, it is both pragmatic and achievable. Now it is also more acceptable than few years ago. You are currently browsing the Conflicts by Ari Rusila blog archives for January, 2013.